>I have read it over and over again that Scotty McCreery and Lauren Alaina should team up and make a country album together. Apparently it is something that many want to see happen and would like to be able to buy in the near future. In the mean time, Scotty and Lauren are still competing against each other and the five other remaining contestants on American Idol season 10. In spite of the love that country fans have for both southern contestants it does not seem to heart either one of them when comes the time to get the votes. Neither Scotty nor Lauren were in the bottom three last night unlike Paul McDonald (see this Paul McDonald bio) for instance who did not seem to be sharing votes with any other contestants. To be fair the guy didn’t have enough votes to be safe let alone share them. 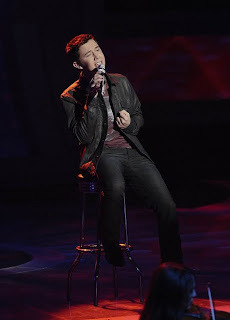 During the top 8 performance night Scotty McCreery sang I Cross My Heart while Lauren Alaina sang The Climb by Miley Cirus. In the mean time people are finding resemblance between Scotty and many celebrities whether they are related to country music or not. Fans have also pointed out that Scotty seems to do a good job at picking songs that are just right for him. In spite of Thia Megia’s ely elimination from the finals, I think that younger contestants are usually favored in the competition both by the judges and the voters. Therefore I think they are going to be rooting for Lauren and since she is only one of two females left that should help her as well. 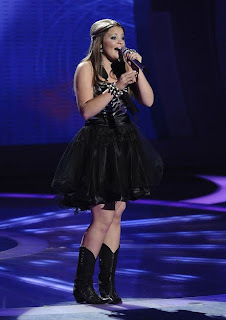 I think the reason they didn’t like Thia as much is because she acted and behave with what seemed to be more maturity than the average 16 year old (except when she gets criticized) I guess American Idol prefers Lauren because even though she looks older with all the makeup she still acts like a silly teen ager.